We sometime need some tool to convert videos into GIFs either to illustrate small actions as static image or for other reasons. Lite version is free. Actually, there is a default tool in OS X to handle multiple GIFs and convert them in to moving images of GIF format. The tool is our quite known Preview App. 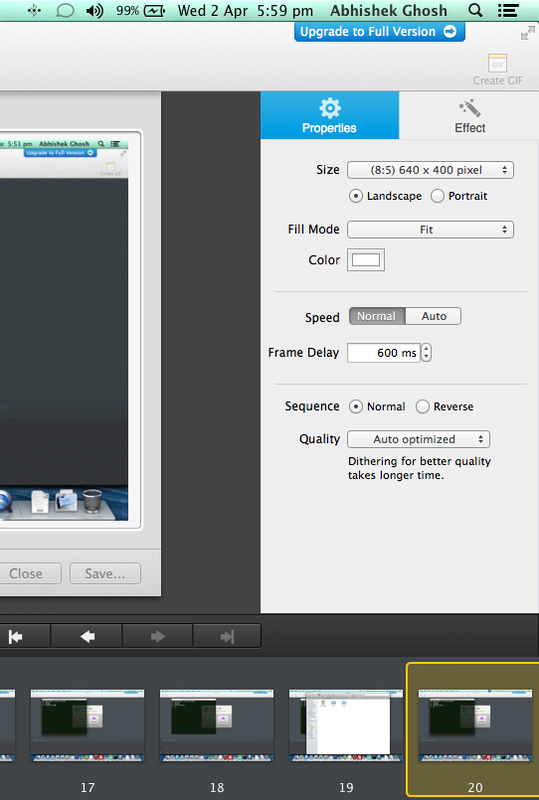 PicGIF Lite for OS X is able to convert videos and images into GIFs in easy steps. You can check our Website’s Google+ Page for such GIF in action. That is complex and created on Adobe Photoshop though. PicGIF has a Paid Version too, we have not checked it. Re-edit existing GIFs. Adjust its size, speed, etc. Supports vast number of image file formats like JPEG, TIFF, BMP, PNG, TGA, RAW, PIC, etc. and any image size. Support almost all common video formats MOV, MPEG, MP4, M4V, 3GP, AVI etc. Support combining multiple formats – images, GIFs, and videos into a new single GIF. There are more information on their App Page. Does the Premium Version of PicGIF Worth to Convert Videos into GIFs? Difficult to answer because it is subjective and depends on you need and budget. We for example has almost all of the Adobe CS products for Production works, so practically we do not need, but; loading a bigger application for small work, sometimes need to think carefully. If you do not use any advanced Photo Editing Software, you can consider to purchase, specially for the Internet Marketers, it is a good tool to promote posts and sell products on Google Plus. This Article Has Been Shared 3993 Times! Cite this article as: Abhishek Ghosh, "PicGIF Lite for OS X to Convert Videos into GIFs," in The Customize Windows, April 2, 2014, April 23, 2019, https://thecustomizewindows.com/2014/04/picgif-lite-for-os-x-to-convert-videos-into-gifs/.